The Nottingham area’s first round of winter weather is expected to arrive overnight Friday and into Saturday morning. 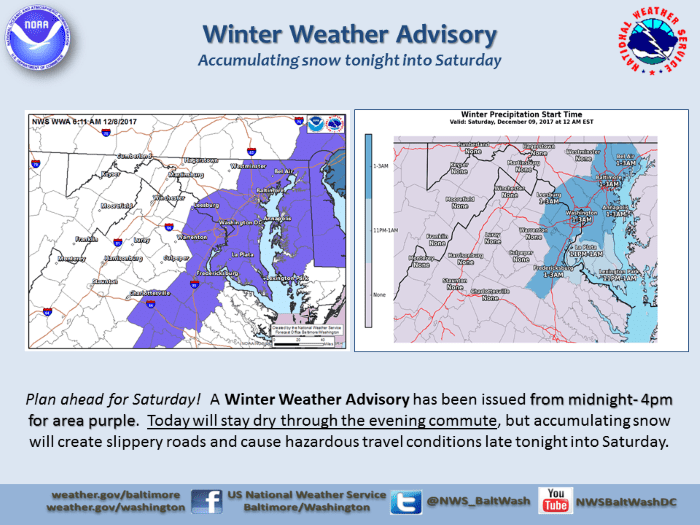 The National Weather Service has issued a Winter Weather Advisory and says that 2 to 4 inches of snow could fall across our region. Friday should remain dry throughout the day, but snow is expected to move in following the evening commute and continue into Saturday. The Baltimore County Police Department would like to remind drivers to never leave their vehicle unattended with the engine running and keys in the ignition. It not only leaves your car at risk to be stolen, but it is also illegal. A Winter Weather Advisory is issued for any amount of freezing rain, or when 2 to 4 inches of snow (alone or in combination with sleet & freezing rain), is expected to cause a significant inconvenience, but not serious enough to warrant a warning.